Mac Miller performs "Suplexes Inside of Complexes & Duplexes" alongside Jay Electronica. Also special guests, Talib Kweli & J.Cole spit their verses on "Just Begun". Finally, Jay-Z himself appears to rap his verse from "Young, Black & Gifted". 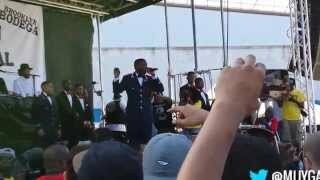 Jay Electronica Shuts Down The Brooklyn Hip Hop Festival. Brings Out Jay Z, J. Cole, Mac Miller ... Jay Electronica stole the show at 2014 Brooklyn Hip Hop Festival.